Wow, what a great sandwich. You know something is great when you both bite into them at the same time, then look up at each other, and smile. You don’t have to say a word. You know it. It’s the best sausage sandwich you’ve ever had. This cedar-planked sausage sandwich is it. First, the Polish sausage is so tender and juicy, with just a hint of cedar. Then, there’s the sweet kraut that is full of caramelized onion flavor and also a hint of cedar. And finally, the kicker, the Sriracha mustard sauce brings the heat and seals the deal. This was the first time I’d cooked sausages on cedar. I know some folks don’t like the aroma or flavor of cedar, but I’ve found that if you don’t over char the planks it’s not that overwhelming, adding that little something different to every dish you cook on it. I love it. Cooking on cedar planks can really change the ordinary into something special, which is why I do it often. Check out my other cedar plank recipes: creamy mashed potatoes, Cajun mashed potatoes, Twinkies, beef sliders, chorizo portabellos, hot dogs, shrimp and grits and spicy grilled shrimp. Soak cedar planks in water for at least 30 minutes. Meanwhile, melt the butter in a large sauce pan over medium-high heat. Stir in the sugar and let dissolve. Add the onions, stir often, and caramelize, about 20 minutes. Do not rush them. Add in the kraut, stir and let simmer 5-10 minutes. Fire up your grill. Place the planks over the fire and let them get lightly charred on one side. Flip planks and add the sausages and kraut. Grill until the sausages are fully cooked, 15-20 minutes. Lightly toast the buns, if desired. Top with the cooked sausages, kraut mixture, and a healthy serving of Sriracha mustard sauce. Add top bun and serve. 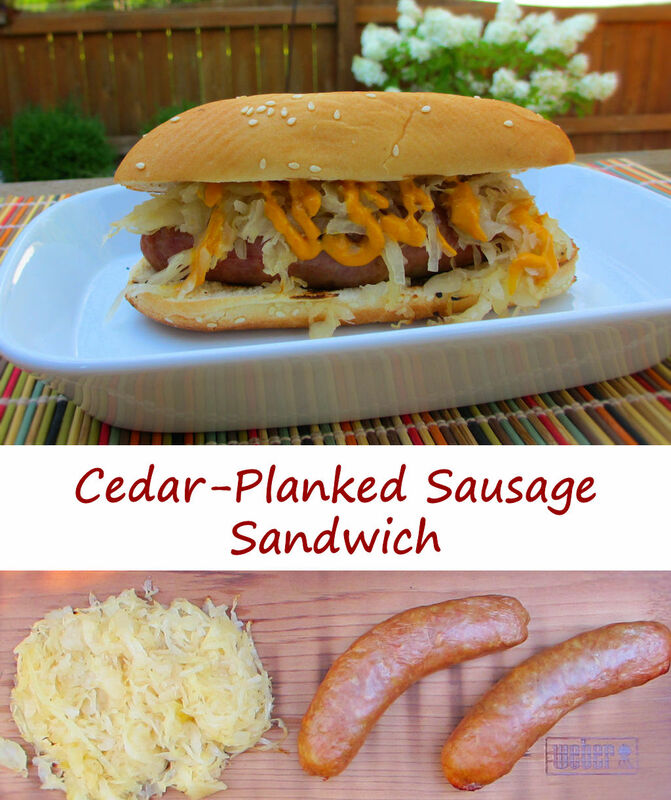 This entry was posted in From the Grill & Smoker, Main Dishes and tagged cedar planked, Cedar-Planked Sausage Sandwich, kraut, polish sausage, recipe, sandwich, saurkraut by Mike. Bookmark the permalink.